Comparison: TomTom Multi-Sport vs. Cardio vs. Garmin Forerunner 620 Braun Silk-épil 7 vs. Philips Satin Perfect: Which Epilator Is Best To Buy? 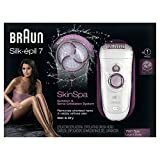 Braun Silk-épil Epilators: SE7921 Spa vs. SE768 (Silk-épil 7), What’s The Difference? Braun’s Silk-épil line includes a wide variety of epilators that cater to different women’s need. In this post, we’ll be comparing two of the most popular choices: The Silk-epil SE7921 Spa vs. SE768 so you can learn the difference between the two models and pick the one that’s just right for you. Wet and dry epilator, can be used in the shower with no issues. Close-Grip technology removes has as short as 0.5mm. Pivoting head adapts to your body contours. Massage system stimulates your skin as you epilate for a gentle experience. Built-in Smartlight reveals the finest hair for a thorough hair removal. Includes a brush head for skin exfoliation after hair removal. Sonic Exfoliation technology provides more than 3,o00 micro-vibrations per minute for highly effective exfoliation. Speed personalization: adjust the speed of epilation to your liking. Cordless: up to 30 minutes of use before needing to recharge. Includes: Epilator, Brush Head, Cleaning Brush, Charging Base and Pouch. 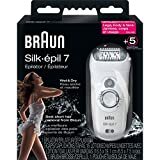 Click here to learn more about this Braun Epilator, read the customer reviews and buy it. Wet and Dry epilator, to be used dry or in the shower. Close-grip tweezers remove hair as fine as 0.5mm. Smartlight feature to reveal fine hairs. Massage system for skin simulation as you epilate. Cordless operation, up to 40 minutes of use before recharge. Includes 5 attachments: shaver head, a trimmer cap, an efficiency cap, a sensitive area cap, and a facial cap. Includes 16 Olay Cooling Wipes. Braun SE7921 Spa vs. SE768, What’s The Difference? Wet & Dry - Can be used in bath or shower for extra comfort and a soothing experience. Close-Grip Technology - Removes hair even as short as a grain of sand (0.5mm). High frequency massage system - Actively stimulates your skin for an extra gentle epilation. Pivoting head - smoothly adapts to your body contours. Smartlight - Reveals even the finest hair for extra thorough removal. Ergonomic angle - Enables convenient use on all body areas. High density brush - 10,000 fine bristles gently sweep away dead skin cells and stimulate the regeneration of the skin surface. Sonic exfoliation technology - More than 3,000 micro-vibrations per minute exfoliate your skin 4x more effectively than a manual scrub alone. The SE768 gives you an extra 10 minutes of Cordless operation: it operates for 40 minutes vs. 30 minutes for the SE7921 Spa. 5 attachments: shaver head, a trimmer cap, an efficiency cap, a sensitive area cap, and a facial cap. – Facts in this post are based on Braun’s comparison chart found here.